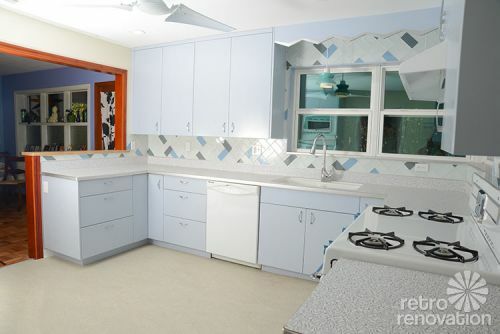 Take a look back at all of the reader home remodeling stories we’ve covered and you’ll notice one common theme often surfaces: Unless the renovation is DIY, most homeowners need to convince their contractors they aren’t nuts for wanting to build 1950s pink bathroom or a ’60s kitchen. 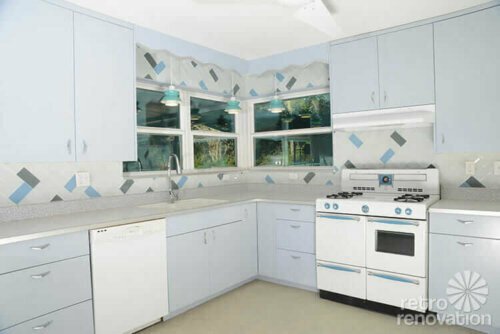 However, in the case of Meghan and her husband Will’s 1954 Florida ranch home kitchen remodel, the surprising opposite is true. The couple were all set to remodel their kitchen using relatively contemporary finishes until Jason, their wood worker, decided he just couldn’t build a modern kitchen around the showpiece of the space — the couple’s professionally restored 1950s vintage Universal stove. Jason’s ultimatum was great news to Meghan, who had tried to convince her husband to go retro from the very beginning. How to get Will on board? Once again it was Jason who suggested that Meghan tell Will the kitchen would be more Jetsons and James Bond than retro kitsch. 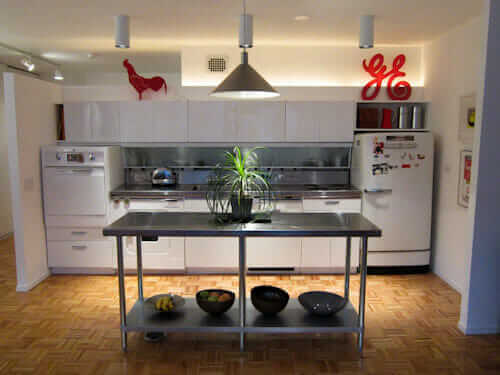 His idea worked — once Will envisioned a cool, space age kitchen where cocktails would be shaken — not stirred — he warmed to the idea of creating a retro modern kitchen. 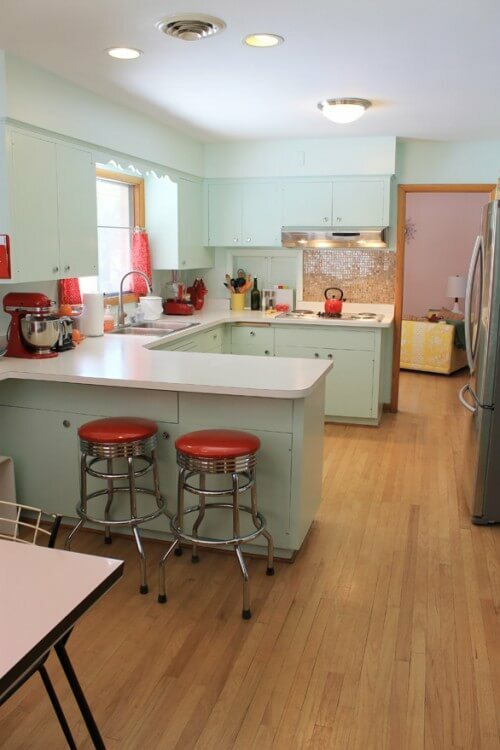 The result is a kitchen that is modern with a retro twist. 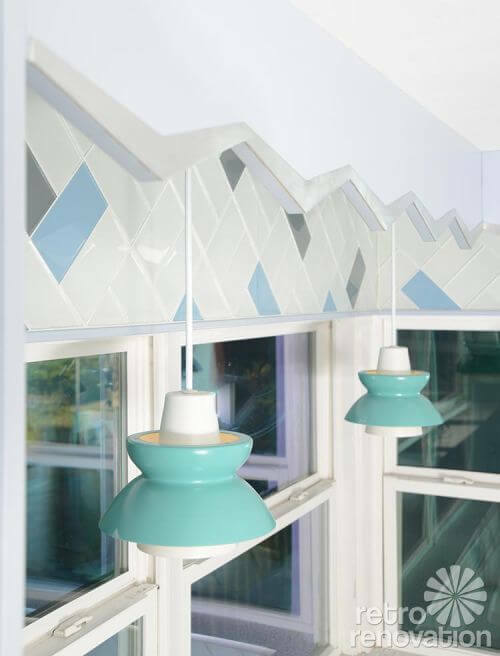 A light and airy white, pastel blue and grey color scheme makes the space feel larger, more open and clean while also allowing the refurbished vintage stove to take center stage. Many 50s inspired details such as the Marmoleum flooring, boomerang laminate countertops with aluminum edging, boomerang chrome cabinet pulls and mid century styled pendant lights help support the vintage vibe of the space while details like the glass subway tile backsplash and custom zig zag valance edged in aluminum add a modern touch. As an added bonus, making a few changes to the kitchen’s layout also allowed Meghan and Will do nearly double their kitchen cabinet storage space. The wood cabinets were custom made and painted a light blue to mimic the style of vintage steel cabinets, but just behind their retro facade, modern amenities like under cabinet lighting, plenty of storage space for large pots and pans, hidden garbage and recycling bins, lazy susans and quiet close drawer and door mechanisms ensure that Meghan and Will’s 1950s kitchen has all the conveniences of a 2014 kitchen. 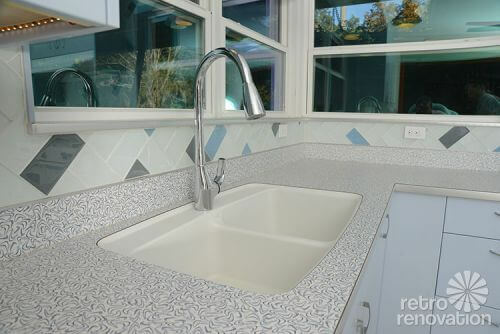 The couple also decided to use new technology to install an undermount sink in their laminate countertops — making it easy for them to wipe crumbs and spills into the sink. 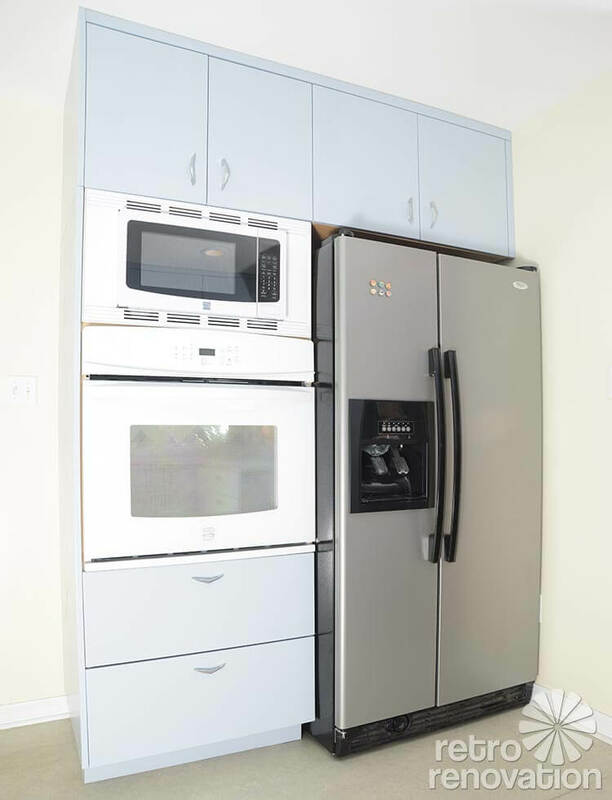 Meghan hopes to replace their side by side stainless refrigerator with a new retro style GE Artistry refrigerator in the near future, but other than that the couple could not be more pleased with their retro modern Jetsons kitchen remodel. 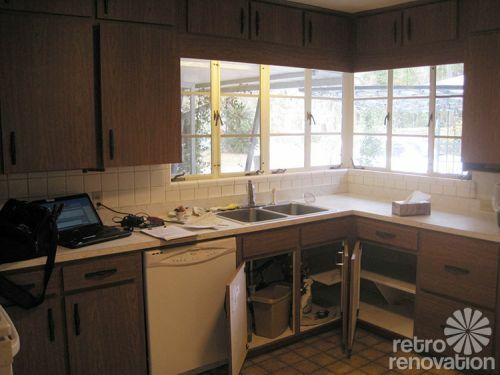 Meghan — a self described “recovering journalist” has written extensively about her retro modern kitchen remodel over on her blog Metaphors Mixed. 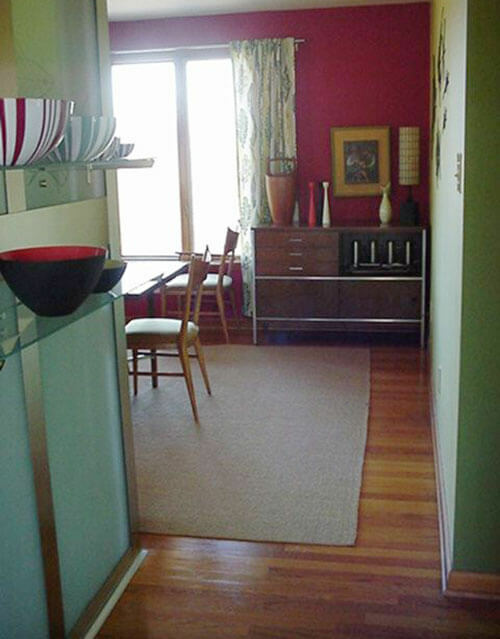 Cabinets — custom made by Jason Straw Woodworker. 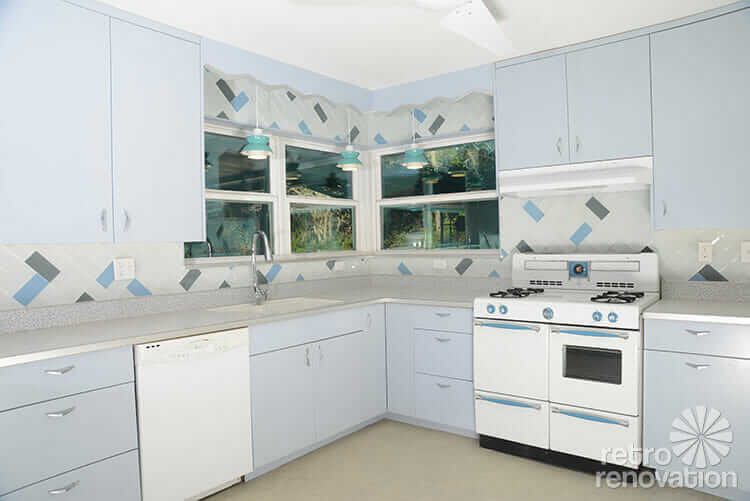 You can read more about Meghan’s “Jetsons ” kitchen remodel on Jason’s website too. 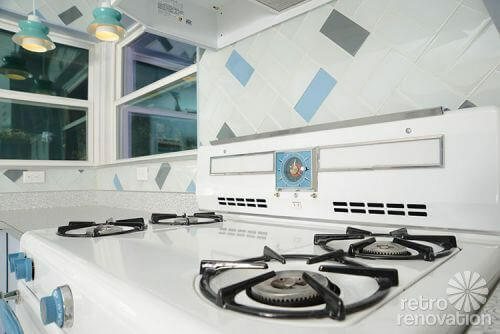 Vintage stove — professionally restored by Antique Appliances. You can read more about Meghan’s stove saga over on her blog. It is fantastic to hear about carpenters like Jason, who believe in restoring homes with period appropriate details. Even better though is that Meghan and Will ultimately decided to go with this colorful — yet sublime — retro flow. Mega thanks to Meghan for sharing her kitchen remodeling story with us — again, to read her full account, head on over to her personal blog, Metaphors Mixed. 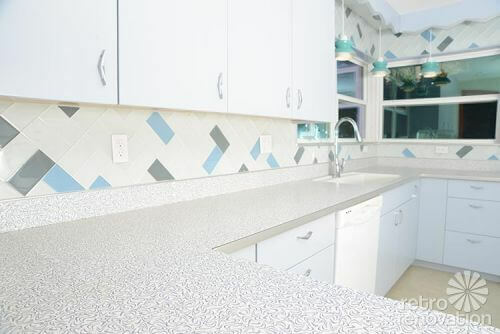 Another huge thanks goes out to Philip Marcel Photography for granting permission to feature all of the “after” photos of Meghan’s kitchen here on Retro Renovation. How creative! 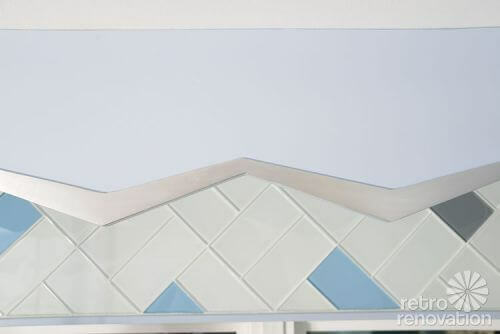 I wonder how many tile layers would have the patience to plan that design on the walls? We have a 1949 stucco house in FL and I was voted down in going retro. Had to give up my double drainboard ,double sink and was just about forced to go with granite. 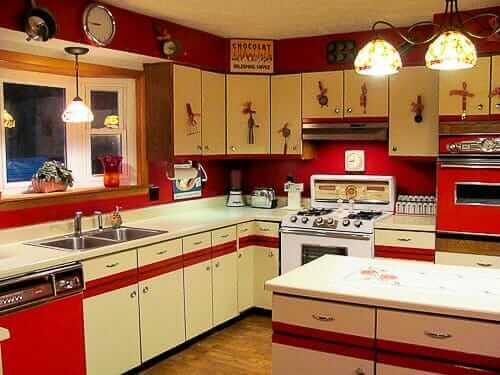 I mean, it’s a great kitchen and I was able to do some creative stuff but I just couldn’t find the people to support my retro vision. OMG! love the lighting! And the range is yummy also! Nice work. I can’t stop LOOKING at this place! Very nice! I’m glad Jason was able to get the homeowners to see the light, or lights, in this case. They are the Astrons from Rejuvenation, and I have one in my kitchen. I also have the same integral sink from Wilsonart. I liked it so well, I had the bathroom model installed when I replaced the counter in my bathroom. This kitchen will be complete when the stainless refer goes away. I have always read, stoves and refrigerators shouldn’t go next to one another because a hot stove effects the fridge temp, or at the very least, make you energy bills higher. The kitchen is very nice.